Salt Lake City has an abundance of very good restaurants. Even for a picky eater like me, who is extremely biased against franchised chain restaurants, there are lots of great food options. In the midst of all these options for dining out, there’s one place I find myself returning to time and time again. Cafe Med is a small, unpretentious restaurant that serves Mediterranean and Middle Eastern food. They have a whole section of Persian favorites on the menu, featuring foods such Kubideh (highly seasoned ground meat kabobs), Kooftah (plum stuffed Persian meatballs), and Persian Spinach and Red Lentil Soup. They have Middle Eastern specialties such as Falafel, Hummus, and Baba Ghanooj. They have plain old American food, which actually looks quite delicious, although the chances of me ordering it are probably quite slim. 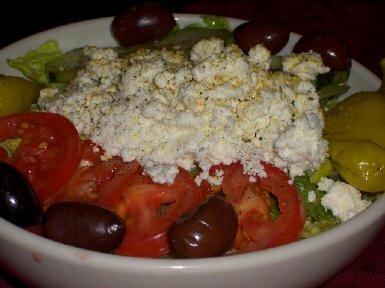 In spite of this multitude of tasty cuisines, when I visit Cafe Med, I nearly always order Greek food. With my salad I order a side of gyro meat with Tzatziki sauce on the side. (If you’re one of my herb blogging friends who is not a native English speaker, it’s pronounced yeero in Americn English.) The gyro meat at Cafe Med is perfect, slightly crispy and full of flavor. Again, I could eat this nearly every day I love it so much. Of course, meat does not have carbs. 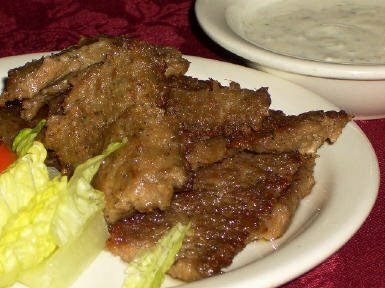 Gyro meat is usually a combination of beef and lamb, ground together and then roasted, and it probably has more saturated fat than the South Beach Diet would recommend, but for a restaurant splurge, I think this is also a good choice. Besides the amazing food, Cafe Med also has the best coffee in Salt Lake. If I went there early enough in the day, you can be sure I would be ordering a latte. 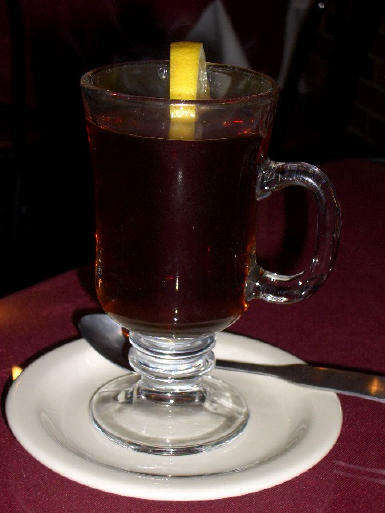 This time I was there at night, so the photo above is their amazing cardomon tea, which is also absolutely delicious. In fact, everything at Cafe Med is absolutely delicious. I can honestly say I’ve never had a disappointing meal there. Although I did tell the server I was a food blogger and asked if I could take photos, I paid for the meal at Cafe Med, and they had no idea I would be writing this post about the restaurant. I don’t really write restaurant “reviews” but once in a while I talk about restaurants in Salt Lake and Restaurants in other cities where I’ve had great meals. Well being from the east and not of Utah I can say this, Cafe med is all right, but not remarkable. They cater more to the Utah attitude of quantity is more important than quality, not to say that tiny plates are best( we all know how awful those place that serve an appetizer as a main course are) but if you want great bodering on phenomenal middle eastern food you want to try a place called Mazza its about 1500 east & 1500 south. Now its not greek food and I have yet to find remarkable greek food here like that which you might find in Newyork or Chicago. But for middle eastern food Mazza is extremely good. I find that restaurants that have large menus fail to do anything real well. instead of focusing on a concise menu and doing it superbly they have too many options and fail to do any of them at a level wich would insight remarkability. Thats my two cents worth! Memeber of a local food club which visits local restaurants monthly. Melissa, me too. I have to admit that I only eat out maybe 3 times a month. Maybe a little more often if it’s around my birthday or Christmas. The rest of the time I’m too busy cooking, blogging, or reading cookbooks.